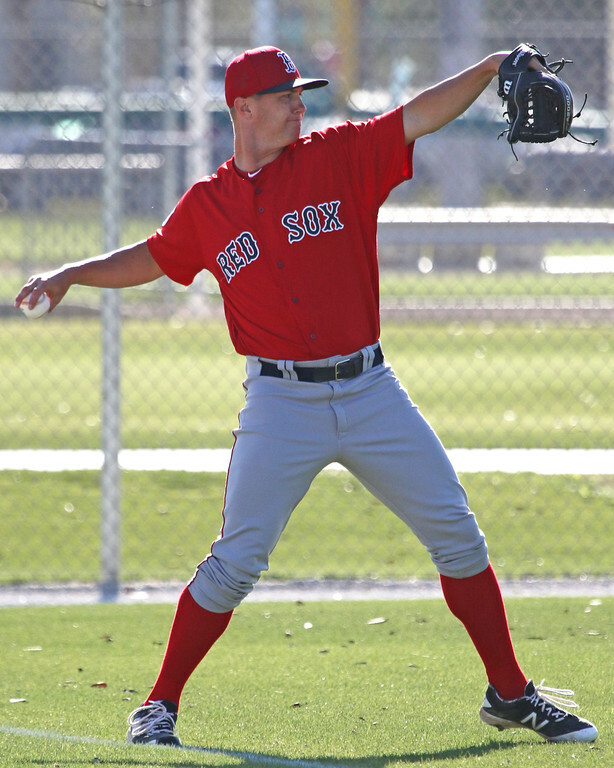 As first confirmed by SoxProspects.com, seventh-ranked prospect Travis Lakins (pictured) has been promoted to Double-A Portland. After a tough season in Salem last year, the Red Sox kept Lakins in High-A to begin his 2017 campaign. Lakins was excellent in seven starts, pitching to a 2.61 ERA with 43 strikeouts and 13 walks in 38 innings. Boston drafted Lakins in the sixth round of the 2015 draft out of Ohio State. In a pair of corresponding moves, the Red Sox promoted Jamie Callahan to Pawtucket and Daniel Gonzalez to Salem. Callahan was dominant in 13 Double-A innings with a 1.38 ERA, while punching out 20 and walking none. He is 21st in the SoxProspects.com rankings. Gonzalez has posted a 1.85 ERA in 24 1/3 innings in Greenville this season, striking out 25 and walking seven. Finally, Kyle Hart was added to Greenville from extended spring training. Before his promotion, Alex Speier of Baseball America analyzed Lakins' strong start to the season. Returning a fourth pitch-- a slider that he threw in college-- to his repertoire has led to strong results for the right-hander. A couple of Red Sox prospects were recognized for fantastic performances last week. SoxProspects.com's top prospect Rafael Devers was named Eastern League Player of the Week after slashing .440/.500/.920 with four home runs and ten RBI. Tenth-ranked prospect Brian Johnson was the International League Pitcher of the Week after tossing eight innings, allowing a run on two hits and two walks. SoxProspects director of scouting Ian Cundall wrote a scouting scratch on right-hander Hector Velazquez. Though Velazquez does not have a standout pitch, he has a five-pitch mix and solid command that could push him to a swingman or spot starter role for the Red Sox later in the season. In the most recent round of changes to scouting reports, updates were added to several players' career notes section. 2016 first-rounder Jason Groome's first full professional season has gotten off to a slow start due to a lat strain suffered in his first start of the season on April 10. Boston is being cautious with the 18-year old Groome, who ranks as the team's top pitching prospect. Though there is no timetable on his return, Groome is working on a throwing progression in Fort Myers. Third-ranked prospect Sam Travis got off to a shaky start at the plate this season. However, he's been turning it on of late and could be positioning himself for a late-season promotion to the major leagues. After his second disappointing start with the Red Sox, Kyle Kendrick has been optioned back to Triple-A Pawtucket. Left-hander Robbie Ross Jr. will take his place on the 25-man roster and work out of the Red Sox bullpen. In two starts in Boston, Kendrick allowed 12 runs in 8 1/3 innings, and he has a 6.00 ERA in four starts in Pawtucket. Due to an off day on Monday, the Red Sox won't need a fifth starter until May 20. Matt Collins of Over the Monster ponders which Pawtucket starter will get the call when that time comes. From the independent leagues to the Red Sox bullpen, Robby Scott has had quite a journey. He's making the most of his chance and has allowed just one earned run in 8 2/3 innings, striking out seven and walking two, becoming Boston's primary left-handed reliever. Scott is the 23rd prospect in the SoxProspects.com rankings.